Sprayers are mechanical devices that are specifically designed to spray liquids quickly and easily. They come in a number of different varieties. In this project we’ll take a look at solar operated mechanical boom sprayers. A sprayer of this type is a great way to cover large areas such as lawns quickly and easily. A sprayer typically consists of a tank for carrying the liquid to be sprayed, a solar panel, a motor (19 W) for pumping out this liquid, spray nozzles on a boom that automatically disperse the liquid in a downward direction over an appreciable area (say 5 or 6 feet), ball valves, a chassis with wheels on which the sprayer is mounted, and a hose attachment for spraying. The device is mechanically pushed from behind and as the supply to the pump is switched on, the liquid is sprayed. This type of sprayers is typically used for spraying lawn chemicals such as pesticides including herbicides, insecticides and fungicides. As the name suggests this project is about an agricultural Sprayer that is powered by solar energy. The agricultural sprayer is used for spraying of pesticides and insecticides like DDT and insecticides in liquid forms. In this project an aluminum frame is constructed using aluminum bars to keep the weight of the frame low. In this frame a retractable link is fixed to the top end of which a solar photovoltaic panel is fixed that converts solar power into electricity. What is Photovoltaic cells/panel (PV)? Photovoltaic cells are devices which ‘collect’ the light and convert it into electricity. The cells are wired in series, sealed between sheets of glass or plastic, and supported inside a metal frame. These frames are called solar modules or panels. They are used to power a variety of applications ranging from calculators and wrist-watches to complete home systems and large power plants. PV cells are made of thin silicon wafers; a semi-conducting material similar to that used in computer chips. When sunlight is absorbed by these materials, the solar energy knocks electrons loose from their atoms, allowing the electrons to flow through the material to produce electricity. This process of converting light (photons) to electricity (voltage) is called the “photovoltaic effect”. This electricity is then provided to battery via a charging circuit and is used for charging the battery. Electric power from this battery is given to an electric motor via control switches, by controlling which entire device can be operated. To the shaft of this electric motor a pump fan is connected. This sprayer pipe is held with hand by the device operator and is directed onto the area where he wishes to spray the pesticides / insecticides. 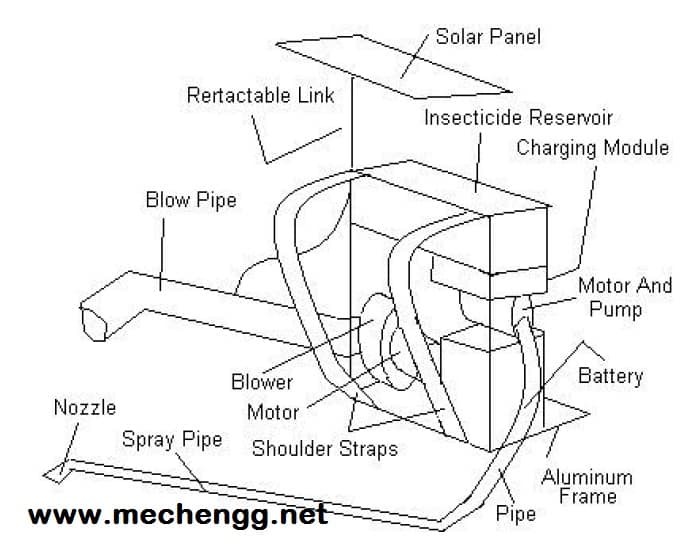 The insecticide reservoir is connected to the spray pipe. Liquid insecticide is sprayed on the crops using Spray pipe, which receives liquid from a reservoir with the help of a pump. This pump is driven by DC motor that receives power from the same battery. Thus insecticide in liquid form is sprayed where wished. The project can also run emergency lamp using battery power thus this project can be of very much use and can be very beneficial for farmers. The running cost of project is nil.